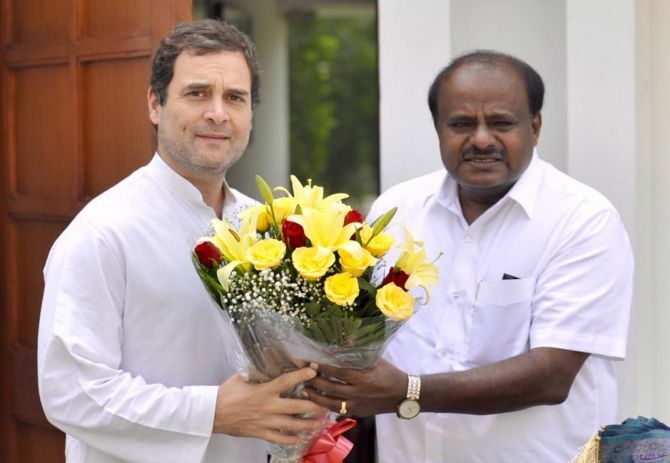 IMAGE: Congress President Rahul Gandhi with Karnataka Chief Minister H D Kumaraswamy, right. Months ahead of the Lok Sabha election, Karnataka's ruling Congress-Janata Dal Secular coalition and the Opposition Bharatiya Janata Party on Monday, January 14, 2019 traded allegations of making a renewed bid to poach MLAs in a fresh political war. According to some media reports, six to eight Congress MLAs are ready to cross over to the BJP and some lawmakers of the ruling coalition having gone incommunicado. Adding to the speculation is that the BJP has shifted all its 104 MLAs to Gurugram in Haryana. The BJP's Karnataka legislators had traveled to New Delhi for the party's national council meeting which ended on Saturday. 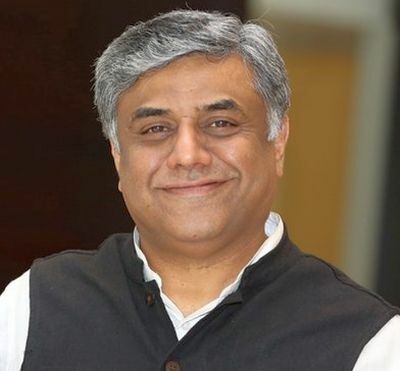 "What the BJP is trying to do is to get 15, 16 MLAs to resign so that they get a majority in the truncated House," Congress MP Rajeev Gowda, below, one of the party's national spokespersons, tells Rediff.com's Syed Firdaus Ashraf. What is happening in Karnataka? The BJP has been trying to destabilise the Congress government from the time it lost the election in Karnataka. They did not get enough numbers to form the government. Years ago, in a similar situation, under (BJP leader Bookanakere Siddalingappa) Yeddyurappa's leadership, they (the BJP) pioneered this whole process called Operation Lotus, where they would get (MLAs) elected from other parties to resign from their seats so that no action can be taken against them under the anti-defection law. After resigning, these MLAs switch loyalty, contest on BJP tickets, spend huge money and win. During that period, a majority of MLAs who resigned and defected won re-election on BJP tickets. Today, the BJP is sitting on tens and thousand of crores. Probably they a have lot of money to offer as inducements (to MLAs). So far, you have not seen much traction for this offer. Lots of MLAs wanted to become ministers or board chairmen. Not everyone could be accommodated. So probably, the BJP was looking at one or two disgruntled guys to see whether it can destabilise the government this way. When the BJP does not win a state, it uses these back hand methods. They did it in Goa, Manipur and Arunachal Pradesh. So when it comes to dirty tricks the BJP is an author of it. Were there any disgruntled MLAs in your party after the ministerial expansion in December? There were some disgruntled elements. From my sources, what I know, except 2 or 3 MLAs who are out of town, everyone else is solidly behind the Congress. The number of MLAs is not sufficient to bring down the government. What the BJP is trying to do is to get 15, 16 MLAs to resign, so that they get a majority in the truncated House. But no MLA today believes they can really win a re-election automatically except (disgruntled Congress MLA) Ramesh Jarkiholi who has a very strong hold in parts of Belgavi district. Except for one or two who are foolhardy and think they are bosses, most others are thanking their stars that they got elected in the first place. The way elections are held today, it is very competitive and you end up spending huge amounts of money. Nobody can predict who will win and who will lose. So nobody wants to face another re-election soon. However much you try to induce this change, you will see most MLAs will not defect. The other thing is that this is very close to the general election. There is no guarantee that (Prime Minister Narendra Damodardas) Modi will be back after the BJP lost the elections in Chhattisgarh, Madhya Pradesh and Rajasthan. It will be foolish for the MLAs to go ahead and bet on the other side by risking their political careers. However if the money offered is so spectacular, they might figure that it is worth playing the game. Congress leader D K Shivakumar says three Congress MLAs are camping in a hotel in Mumbai in the 'company of some BJP leaders'. As far as I know, there are counter moves to get BJP MLAs to resign. It is not fun, but a very ugly side of politics. I anticipate nothing will happen. These guys (the disgruntled Congress MLAs) are just playing bargaining games, wanting some other benefits within the party. I don't think anyone will be foolish enough to risk their MLA seat at this point on either side. It seems all is not well in the Congress-JD-S coalition. Chief Minister H D Kumaraswamy was seen crying in public. The chief minister and his father H D Deve Gowda have their own style of speaking which involves emotions. They are happy to cry because they feel the pain of people at certain times. They are not shy about showing their empathy if they break down. He is not a control freak like PM Modi or (BJP national President) Amit (Anilchandra) Shah. We are emotional people and we are happy to demonstrate that even if there is some frustration in our own internal mechanism. We have no problems being who you we are. Your assessment of trouble in the coalition is totally wrong. We are quite strong and are working together. The Opposition and media are trying to constantly fish in troubled waters, trying to blow things up. Is your government in Karnataka stable? When Kumaraswamy became chief minister, it was like magic and he could do no wrong. People may say now that it has no magic as it used to be like earlier. There are so many issues that need sorting out. But that is part of the give and take of coalition politics. The BJP has moved its Karnataka MLAs to Gurugram. If the BJP is trying to poach us, why do they have to go and protect their own MLAs? Because they are afraid that the whole bunch of them will move away from the BJP. If you want my professorial response, if you look at Telangana and Andhra Pradesh, you will find out people who became chief minister were able to induce tremendous number of defections. The speaker whose job is to disqualify them did not do so and some became ministers. So there is a flaw in the working of the anti-defection law and how the system operates. As a result, there is a thick grey line on what is right and what is wrong. Everyone is exploiting that in a different way. Do you feel the BJP wants to issue a message before the general election that coalition politics did not work in Karnataka, so it will not work in New Delhi too? They would certainly do that. It is Modi's line that he is going to show strong government led by one party while we would have to form a coalition according to present projections. Our counter to that is (then prime minister) Dr Manmohan Singh ran a coalition government very successfully for 10 years. (Then prime minister Atal Bihari) Vajpayee led a coalition government through the BJP. If you look at the policy outcome track record of these two governments -- governance indicators, reforms, policy growth, GDP growth -- a lot of them grew exponentially under a coalition government. In comparison, Modi is a failure in spite of a majority in the Lok Sabha. Can we say that your coalition government will complete its five year term? It will not only last a full term, but will also deliver spectacular results.